Paella. The name alone conjures up images of wide shallow pans, brimming with rice, seafood, meats and more. The hustle and bustle of narrow Spanish streets. The name alone conjures up images of wide shallow pans, brimming with rice, seafood, meats and more. The hustle and bustle of narrow Spanish streets. The cacophony of city life. Please do not confuse this very special dish with packet imitations, or even the very fine Italian risotto. A 34 cm polished steel paella pan, large enough for up to six generous paella serves – just add ingredients. These beautiful pans have been made in Valencia for many centuries and can be used on gas and electric stoves, on open flames, on charcoal grills and even in your oven. Presented in a gift box lined with satin tissue and tied with ribbons. Your own personal gift message. This hamper includes free delivery anywhere in Australia. 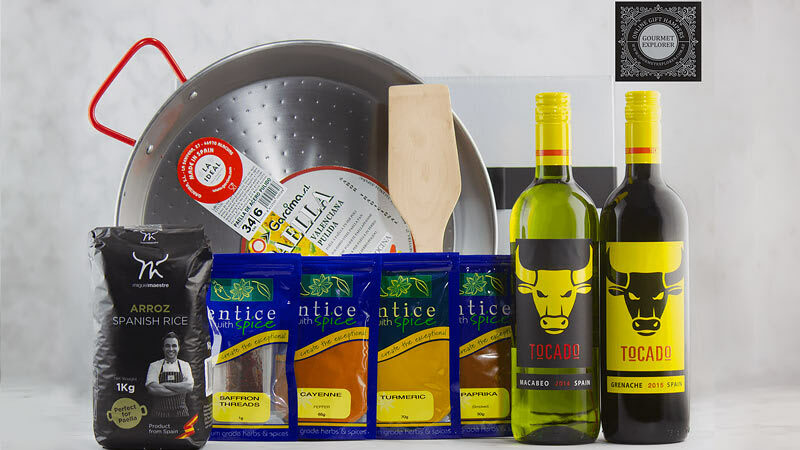 The Spanish Paella Kit has all the instructions, ingredients and equipment you need to create this delicious Spanish dish. What makes paella so special? A true paella pan is wide, round, and shallow and has splayed sides. It does not have a lid. It has two looped handles and dips slightly in the middle so the oil can pool there for the preliminary sauting. The shape of the pan, which is called either a paella or paellera, helps ensure that the rice cooks in a thin layer. The Valencians say that the cooked rice should be only as thick as "un ditet", or the width of one finger. The key is to maximize the amount of rice touching the bottom of the pan because that is where the flavour is. The paella pan can also be used as a serving dish! When your paella recipe is cooked, simply place the delicious pan of food in the middle of the table. Yum! We are committed to getting your order to your door (or the person you’re giving it to) as fast as possible. That’s why all kits include free delivery anywhere in Australia, via Australia Post’s national parcel service. You need to sign for your delivery, so we recommend it be to a work address. If that is not possible, and if no one is available when Australia Post attempts delivery, the courier will leave a card in your letterbox indicating that a parcel is awaiting collection at your nearest Post Office.